So, I’m a day late, but this is my last post in this series about Homemade Cleaners. We first talked about homemade soft scrub, then about all the wonderful cleaning uses of vinegar, and last week I showed you a couple of homemade cleaning recipes I plan to try in the near future. Today, I’ll be telling you about cleaning your home with something you can cook with, too, the wonderful, citrusy lemon! We are going to be cleaning with lemons! I love the smell of lemon. It’s so fresh and it just smells clean. Not only is the smell of lemon refreshing, but lemons have antibacterial properties that can help with cleaning your home. Here are someways you can use lemons and their juice to clean your home. Natural Bleach Lemon juice will naturally bleach stains on white clothes. Rub some lemon juice on a stain and let it dry in the sun. 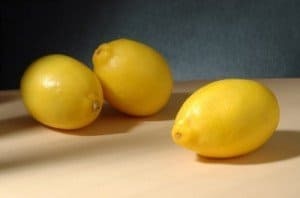 Countertops and Cutting Boards Use a lemon half to wipe down your countertops and cutting boards. You can follow up with a damp cloth to wipe away any extra juice. Freshen drains Grind lemon rinds in your garbage disposal for a fresh scent in your kitchen. Use with vinegar Add some lemon juice to the vinegar you use for cleaning for a better scent and extra antibacterial properties.